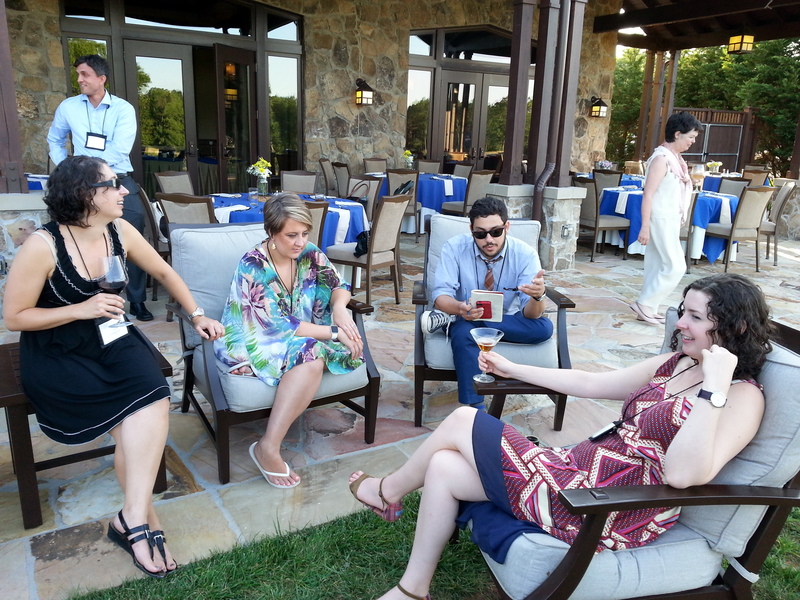 I have so many wonderful, wonderful memories of my nearly two weeks up “on The Mountain” at Sewanee Writers’ Conference. If I were a more disciplined memoirist, I could get a whole book out of those twelve days. But here, I have time only for these too-brief blog posts, so I’ll save my amazing workshop group and the craft lectures and the parties and the tours and people and the love and the creativity and so much more for forthcoming posts. Here, now, sitting at home still smelling of airports, I have time only to share a handful or so of the memories that stand apart from all the regular glory that is Sewanee. These are the things that make the place feel magical. These are just some of the many, many memories I am going to cherish the rest of my life. At my first breakfast, eager to meet new people, I asked to join a table and realized I’d inadvertently sat down with fiction faculty Christine Schutt and poetry faculty Charles Martin and Daniel Anderson (who teaches at OU in Eugene). Soon, we were joined by poetry faculty A.E. Stallings, followed shortly by journalist John Psaropoulis, whose voice I recognized immediately from NPR but who I didn’t know is married to Stallings. I have to admit, I felt more than a little star-struck, but everyone was so open and friendly the whole conference that the nerves soon passed. This rebellion is entirely crushed, the woman read aloud. God Amighty. Look here, the girl said, pointing. Says Jeff Davis is heading this way, says he’s heading for Texas. The war ain’t over yet then, is it? Can’t you read, girl? The generals done surrendered. Jeff ain’t gonna fight the war hisself. Kirby ain’t surrendered yet, Clovis said. And it’s true they’s still some men over in Texas might hold out awhile yet. They might aim to set theyselves up a country of they own again, it’d be just like them. 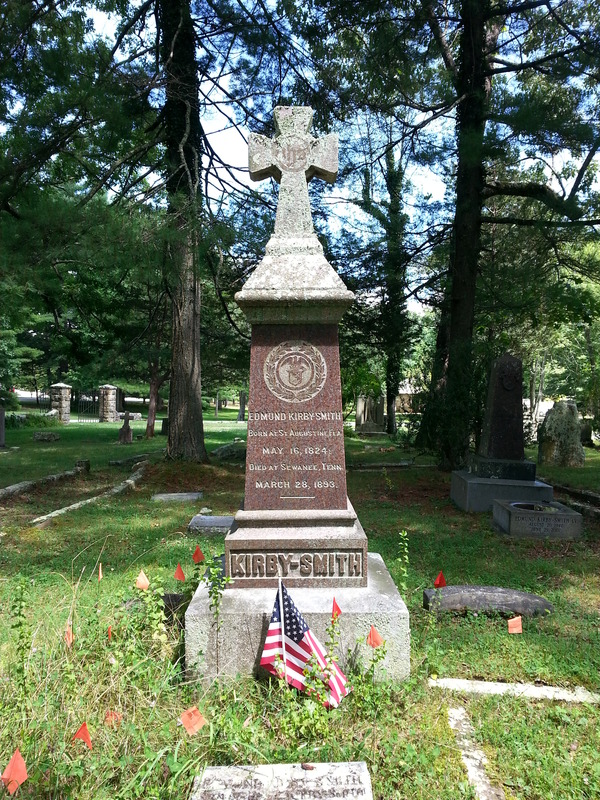 I wound up reading a bit about Kirby-Smith at Sewanee, and I plan to make a larger reference to him in my new novel just as a personal reminder that I workshopped this new book near Kirby-Smith’s grave. 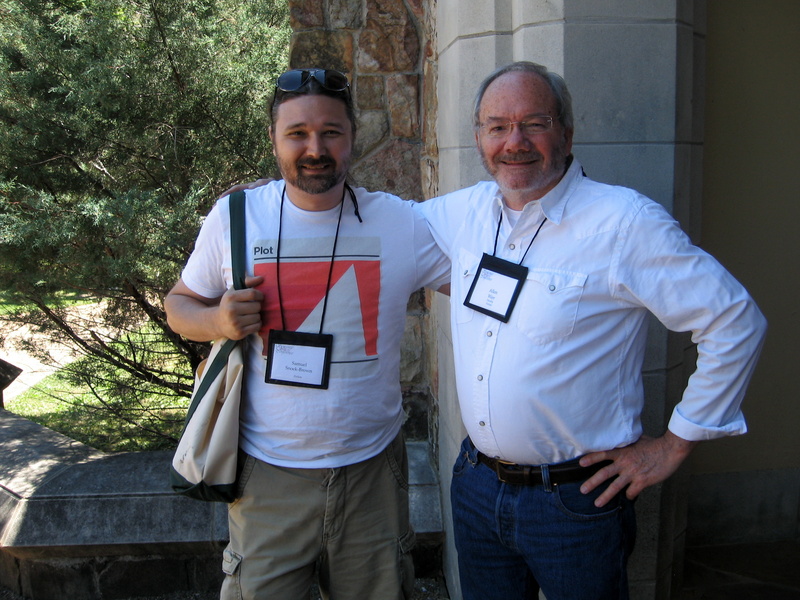 Me and Allen Wier on the last day of our workshop. One of my favorite memories is rocking on the porch of the Sewanee Inn while Allen Wier and I discussed Texas history and novel-writing in the morning sun. And later, drinking with Allen at the French House and listening to stories about his flight school. In fact, listening to Allen Wier tell stories in general. That man knows how to spin a yarn! Allen was tremendously helpful in his comments on my novel, giving me both concrete suggestions on particular aspects of the book as well as larger structural ideas and, most importantly, the confidence and motivation to move forward on the book. I went into Sewanee with a second draft of this novel, having tossed almost 100 pages and started over. I was feeling good about the new direction I was taking, but I couldn’t see far enough into the novel to know if I was on the right track. Allen showed me the long view, and now I’m eager to get to work. One day on the way to a meal, I spotted a guy cruising around campus in an original WWII Jeep converted for civilian use, painted black, a pair of dogs in the backseat. I commented on it to the friends I was walking with and the guy pulled across the lanes and parked, facing oncoming traffic, smiling. He saw me point and thought we might need to talk to him. We told him we were admiring his Jeep and he sat there, his Jeep idling, telling us its history (he inherited it) and showing us some of its unique features, like the rack in the folded-down windshield where you could store the poles for the canvas top. He never uses that top, so instead he keeps a pair of walking sticks bolted into the compartment for those days he just feels like pulling over and going for a hike. In the back seat, his two dogs watched us, the younger strapped in by a leash and the older dog, who knew better than to jump from the moving Jeep, lazing on the seat beside him. 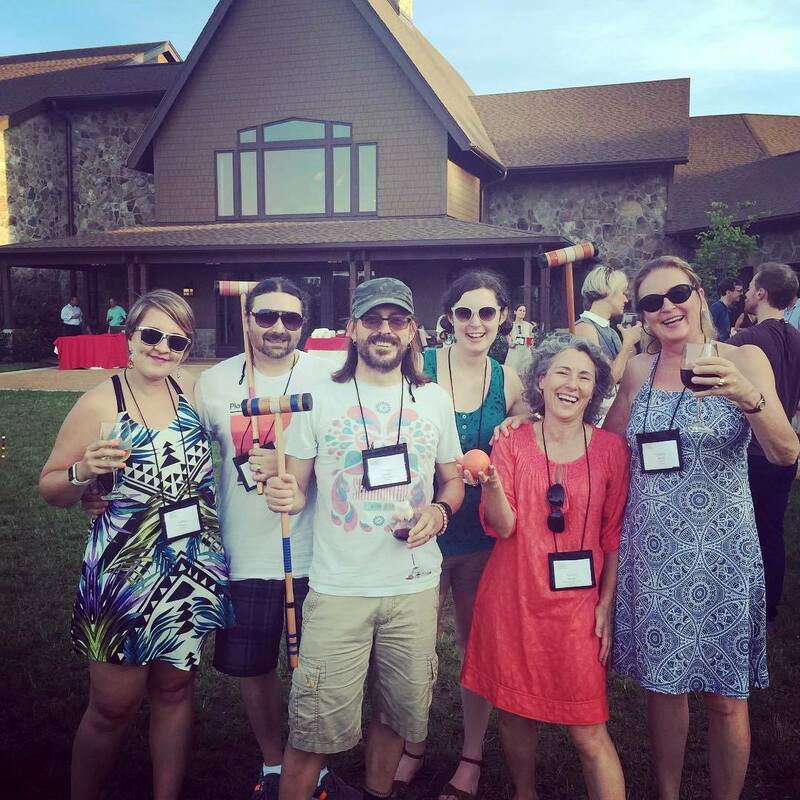 At a social event, I played a game of croquet with my fellow UNT alum Caitlin Pryor, author Christian Kiefer, poet Annie Rudy, my fellow Portlander Natalie Serber, and Sewanee Writers’ Conference poetry faculty member Sidney Wade. It was hard work, considering that each of us played the game with a drink in one hand. I had a pretty commanding lead for the first half of the game, but Sidney Wade rallied on the route back to the first stake and she smoked us all. Sammy is truly a wonderful human being. I love this man. 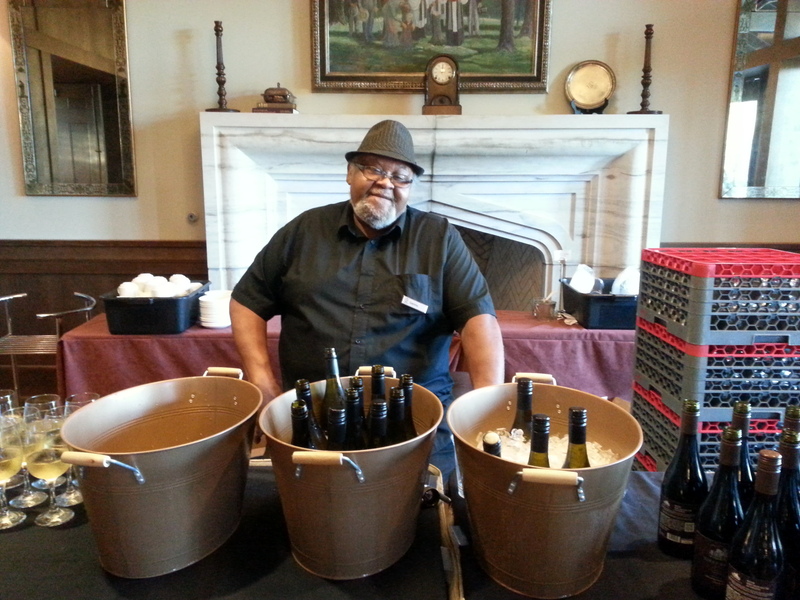 I befriended Sammy the bartender, whose smiling face and lovely voice always greeted me on wine nights and at parties. He served me my first two Tennessee whiskeys at a cocktail party at the vice-chancellor’s house, and he served me my last glass of red wine at the final dinner of the conference. He also once gifted me a half-full bottle of red wine leftover from a social event. One afternoon on a light day, I joined a pair of poets for a swim in the quarry, though “swim” is probably too vigorous a term for sunning like a lizard on a huge mossy boulder covered with just a few inches of water. Later, poetry faculty Maurice Manning arrived with his family and joined us on the boulder. Like it was any other day. The conference organized several hikes, all but one of them at the unholy hour of 6 am (Allen Wier, a night owl like me, joked more than once that it’s dangerous to leave the house before 10 am because gravity doesn’t work until mid-morning). I skipped all those, much happier with my sleep, but finally, on the second Friday, I got away by myself and hiked nearly five miles out to the Memorial Cross and then along the Perimeter Trail, the path skirting cliffsides and, one time, literally carving through a boulder. The stretch I hiked also passes under a light waterfall, just a thin shower dropping in cool splashes from an overhang, and I stopped to run my hands under the water and wet my hair. Later, I also crossed a creek so shallow I walked out into the bed and up to a series of thin cascades over the rippled sedimentary rock. And in the shade of one cliff overhang, a rubbleyard of flat stones splintered off the cliff has inspired hikers to practice stone-stacking, and I left a delicate stack of my own. Stacked rocks on the Perimeter Trail. My own stacked rocks on the Perimeter Trail. A hole through a massive boulder on the Perimeter Trail. The overlook from Morgan’s Steep on the Perimeter Trail. Me at the overlook from Morgan’s Steep on the Perimeter Trail. The conference also included a handful of unexpected performances by faculty members, including a magic show from Tim O’Brien and a song composed by Steve Yarborough and Tony Early and played by the Franklin County Ramblers: Tony singing his lyrics while Steve and poet Maurice Manning play guitar. There was also the amazing table-read of Dan O’Brien’s memoir play in which Dan O’Brien was joined by actor Dan O’Brien. No relation! They even looked the same — and Actor-Dan was reading the part of Playwright-Dan. It was surreal. At dinner on the last day, I found a group of my poet friends collaboratively composing a dirty limerick for a limerick contest. I joined them just to listen in and laugh, and then, as they read the draft aloud, Alice McDermott walked past in the background and overheard the limerick and cracked up. Realizing around midnight that I needed to leave the last Sewanee party if I was ever going to finish packing and be rested enough for the trip home, I hugged friends goodbye, and then, as I started walking up the drive to my dorm, the band started playing John Denver’s “Take Me Home, Country Roads.” The moment was so perfect, so bittersweet and sublime, that I broke into sobbing and laughter at the same time. It would be an understatement to say you had a ball, then?